La1−xAgxFeO3 (x = 0.05–0.25) perovskites deposited on a honeycomb-shaped monolithic metallic support were used as catalysts for the total oxidation of hydrocarbons. Monolithic catalysts were prepared by washcoating honeycomb substrates with lanthanum-stabilized γ-Al2O3, on which La1−xAgxFeO3 was deposited. Catalysts with La1−xAgxFeO3 perovskites show higher activity for methane oxidation at x ≥ 0.05 and hexane oxidation at x ≥ 0.1 than LaFeO3 catalyst. The perovskite catalysts were characterized by XRD, XPS, SEM, TEM, TPR-H2, O2-TPD and BET specific surface area measurement. Ag forms solid solutions with the La1−xAgxFeO3 perovskite lattice for x = 0.05–0.1. In La1−xAgxFeO3 perovskites (x ≥ 0.1), Ag0 particles with average crystallite sizes from 31 to 41 nm were also identified. When Ag is introduced into the LaFeO3 perovskite, both the changes occurring after some Ag is incorporated into its structure and the presence of large crystallites of metallic silver contribute to the catalysts’ activity increase. 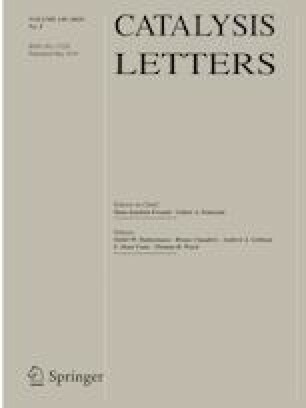 The online version of this article ( https://doi.org/10.1007/s10562-019-02779-7) contains supplementary material, which is available to authorized users. Oxides with a perovskite ABO3 structure, where A is a rare earth element and B is a transition metal, have been investigated for years as materials for various uses [1, 2, 3, 4, 5, 6, 7, 8, 9, 10, 11, 12, 13, 14, 15, 16, 17, 18, 19, 20, 21, 22, 23, 24, 25, 26, 27, 28, 29, 30, 31, 32, 33, 34, 35, 36]. They show very good catalytic properties and are less expensive than noble metals, and they can be used as catalysts to oxidize hydrocarbons and carbon oxide, and as three-way catalysts (TWC) [1, 2, 3, 4, 5, 6, 7, 8, 9, 10, 11, 12, 13, 14, 15, 16, 17, 18, 19, 20, 21, 22]. Perovskites LaFeO3  and LaMn0.9Co0.1O3  show good properties, which are further improved by introducing Ag into the perovskite, for the oxidation of carbon black. R1−xAxMnO3 perovskite manganites (where R is a rare earth cation and A is a doping cation) exhibit great magnetoresistance and the magnetocaloric effect . Since mixed (electron and ionic) conduction occurs in the LaFeO3 perovskite, the latter can be used in solid oxide fuel cells . ABO3 perovskites, with La in position A and metal B as Mn, Co, Fe or Cr, show good catalytic properties in oxidation processes [6, 7, 8, 9, 10, 11, 12, 35, 36]. The activity of perovskites in methane oxidation decreases in the order: LaCoO3 > LaMnO3, LaFeO3 > LaCrO3 . Their catalytic activity is determined mainly by oxygen mobility, the redox properties of the transition metals and the perovskite structure. As catalysts, one can also use perovskites in which the cation in position A and/or B is partially substituted with a different valency cation. In such cases, the activity of the catalysts for oxidation reactions is enhanced. When the cation in position A is substituted with a different valency cation, the oxidation number of the cation in position B changes and defects arise in the perovskite’s structure [1, 2, 3, 4, 5, 6, 13, 14, 15, 16, 17, 18, 19, 20, 21, 22]. As a result of a cation deficit, an oxygen deficit or an oxygen excess in position A or B non-stoichiometry may arise in the perovskite [4, 5, 24, 25]. Oxygen vacancies are more common than cation vacancies in the perovskite’s structure . A considerable increase in the catalytic activity of LaFeO3, LaFe0.5Co0.5O3 , LaNiO3, LaCoO3 [1, 5] and LaMnO3 [1, 14, 15, 21] perovskites was achieved by partially replacing La+3 in them with an Ag+1 cation. However, there is no agreement between researchers as to the amount of silver which can be incorporated into the crystal lattice of perovskites. This may be due to the large number of different synthesis methods, co-precipitation [1, 2, 15, 21, 30, 31], citrate-gel [3, 4, 23], sol–gel [5, 27, 29], such as solid-state reaction [26, 27, 28], flame pyrolysis , polyol , hydrothermal , combustion [24, 25, 34], spray decomposition  and microemulsion methods , used in the investigations. Hien et al. and Ye et al. found that using various methods to synthesize La1−xAgxMnO3+δ perovskite, a single perovskite phase is obtained at x < 0.2. Whereas at x > 0.2 other phases, mainly Ag-metallic ones, also form. Ehi-Eromosele et al. maintain that when this perovskite was synthesized using the solid-state or sol–gel method, Ag0 was detected apart from the perovskite regardless of the amount of silver introduced. When hydrothermal synthesis was used at x > 0.04, Ag2O3 was found in addition to the perovskite . In the case of La1−xAgxMn0.9Co0.1O3 prepared using the citrate method, an Ag2O phase, the amount of which increased with the Ag content in the perovskite, was observed . A single phase of La0.8Ag0.15MnO3 perovskite was obtained using rapid solution combustion synthesis and oxalyl dihydrazine as the fuel . A single phase of La0.9Ag0.1Mn0.9Co0.1O3 perovskite was obtained using the citrate method . The research to date has shown that the solubility of silver in perovskites is low. This paper presents the physicochemical properties and methane and hexane oxidation activity of monolithic catalysts containing 12.2–12.9% LaFeO3 perovskite in which some of the lanthanum was substituted with silver to give La1−xAgxFeO3,x = 0–0.25. The physicochemical properties of the perovskites were determined using the following methods: X-ray diffraction (XRD), scanning and transmission electron microscopy (SEM, TEM), X-ray photoelectron spectroscopy (XPS), BET specific surface area measurement, H2 temperature programmed reduction (TPR-H2) and O2 temperature programmed desorption (O2-TPD). The effect of the silver content of the perovskite on the homogeneity of its structure and on the activity and operational stability of the catalysts containing the perovskites was examined. In the literature to date, there are no test results for monolithic catalysts on metallic support containing La1−xAgxFeO3, x = 0–0.25 perovskite with a silver addition. When a monolithic catalyst is used, the gas flow resistance and pressure drop on the catalyst bed decrease. Moreover, thanks to better contact between the gas and the catalyst’s active surface than with granular catalysts, the volume of the catalytic converter can be reduced . The catalysts investigated can prove effective in removing hydrocarbons from exhaust gases and, thus, protecting the environment. The supports for the monolithic catalysts were made of 0.05 mm thick heat-resistant FeCr20Al5 foil. They were shaped as 70 mm high and 26 mm diameter cylinders, with a honeycomb cross section with triangular channels. The supports were etched in 10 wt% sulfuric acid at 60 °C for 1.5 min, washed in distilled water and dried at 150 °C. As a result of this treatment, the specific surface area of the support increased. A washcoat containing Al2O3 with a 0.12% addition of La2O3 was deposited on the prepared supports. The sol was obtained by thoroughly mixing 3.8 wt% Al(OH)3, 0.16 wt% La(NO3)3·6H2O, 2.5 wt% glycerine and water. A few drops of ammonium hydroxide were added to the sol to obtain a gel. The washcoat was deposited on the monolithic supports by immersing them in the gel, drying them at 150 °C and then calcining at 400 °C for 3 h.
where: s solid, g gas. Obtained perovskite was ground in a mortar to obtain grains less than 0.10 mm in diameter. The perovskites were mixed with 0.6 g/cm3 citric acid solution, obtaining a slurry in which the support was then immersed. The resulting catalysts were calcined at 500 °C for 3 h.
The catalysts contained 12.2–12.9 wt% of the perovskite relative to the weight of the support after etching. In the same way catalysts with the perovskite but with no silver addition, containing 15.9 wt% and 10.9 wt% of LaFeO3 were made. The crystalline and phase identification of the prepared LaFeO3 perovskites was determined by X-ray powder diffraction (XRD) using PANanalytical X’Pert PRO diffractometer with Cuα radiation (λ = 0.15406 nm). Data were recorded in the 10°–80° 2θ range with an angular step of 0.017° and a counting time of 0.26 s per step. Diffraction peaks of crystalline phases were compared with those of standard compounds reported in the JCPDS Data File. The textural properties of the prepared LaFeO3 perovskites calcined at different temperatures were obtained from nitrogen physisorption measurements at − 196 °C using a Micromeritics ASAP 2020 apparatus. The samples (~ 0.8 g) were degassed in vacuum at 300 °C for 4 h prior to the measurement. The specific surface area (SBET) was calculated using the Brunauer–Emmett–Teller (BET) method and the total pore volume (Vp) was determined at a relative pressure of P/Po = 0.98. The morphological and structural characterization of the LaFeO3 perovskite was additionally performed by high-resolution transmission electron microscopy (HRTEM) using a Philips CM 20 microscope operated at 200 kV and provided 0.25 nm resolution. The analysis of the presented phases was made based on the fast Fourier transforms (FFT) obtained for the recorded pictures. The distance of the spots and angles between of them were checked with the database using the Process Diffraction program. The morphology of the catalysts was examined using FEI Quanta 250 scanning electron microscope in a secondary electron (SE) and back scattered electron (BSE) imaging mode, operating at 15 kV under 10−5 Pa pressure. Before SEM examination the samples were sputter coated with a thin layer (~ 15 nm) of carbon. Temperature-programmed reduction (TPR), and O2-temperature-programmed desorption (O2-TPD-MS) were carried out using a Micromeritics apparatus model Autochem II 2920 with a thermal conductivity detector (TCD). The composition of the outlet gas was continuously monitored by means of a quadrupole mass spectrometer (OmniStar QMS-200 from Pfeiffer Vacuum). The catalyst (0.2 g) was loaded in a quartz reactor, and prior to every TPD or TPR run was heated (10 °C/min) up to 750 °C in flowing synthetic air. TPD-MS of pre-adsorbed oxygen was carried out in He as carrier gas (30 cm3/min), after a saturation of the sample in 20 cm3/min of oxygen at 750 °C, followed by cooling down to 50 °C. The following temperature program was adopted: the catalyst was kept at 50 °C for 10 min, the temperature was then raised (10 °C/min) to 900 °C. In TPR analysis, a 5% H2/Ar (30 cm3/min) stream was passed through the sample and the temperature was raised from 20 to 1000 °C with a ramp of 10 °C/min. XRD measurements were performed at the end of the TPR-H2 run. X-ray photoelectron spectroscopy (XPS) measurements were performed using a SPECS PHOIBOS 100 spectrometer and Mg anode (1253.6 eV) operating at 250 W for high resolution spectra. Before the analysis the surface was cleaned by Ar+ sputtering with a low energy beam (2 keV, 4 μA/cm2, 60 s). The spectra were processed and fitted by the SPECLAB and CasaXPS software using the Gaussian–Lorentzian curve profile and the Shirley baseline. The accuracy of the reported binding energies was ± 0.1 eV. The C 1s peak at 284.8 eV, representing carbon contamination, was used as the reference for all the spectra. The catalytic activity in the complete oxidation of methane and n-hexane was tested in a quartz flow reactor placed in a electrical furnace with a controlled temperature rise. The reaction temperature was measured by a Cr-NiCr thermocouple placed in a monolith channel at the height of 16 mm from the gas outlet. 1% of methane was oxidized in air in the 400–700 °C range. The total gas hourly space velocity (GHSV) for methane oxidation amounted to 5800 h−1 (based on the total monolith volume). Also the activity of the catalysts in the oxidation of 1500 ppm of n-hexane in air in the 270–560 °C range and at the GHSV of 8900 h−1 was tested. Measurements were taken for each catalyst two times, and the measurement error was about ± 1% of methane conversion measured. The methane and carbon dioxide concentrations before and after the oxidation reaction were measured using a DP-27 analyser made by Nanosens. The analyser can measure CH4 concentrations in a range of 0.00–5.00 vol% and CO2 concentrations in a range of 0.00–10.00% vol., with an accuracy of ± 0.05. A MEXA-574GE analyser made by Horiba was used to measure n-hexane and carbon dioxide concentrations in hexane oxidation. The analyser measures hexane concentrations within a range of 0.00–10,000 ppm, CO2 concentrations within a range of 0.00–20.00% vol. and CO concentrations within a range of 0.00–10.00 vol%. The conversion of hydrocarbons over the tested catalysts was calculated from the methane and n-hexane concentrations measured before and after the reaction. The presence of a LaFeO3 perovskite phase, characterized by the strongest reflection at 2θ of ~ 33° (PDF card No. 70-7777), was found in the XRD patterns of the prepared LaFeO3 (Fig. 1a) and La1−xAgxFeO3x = 0.05–0.25 catalyst samples (Fig. 1b–f). 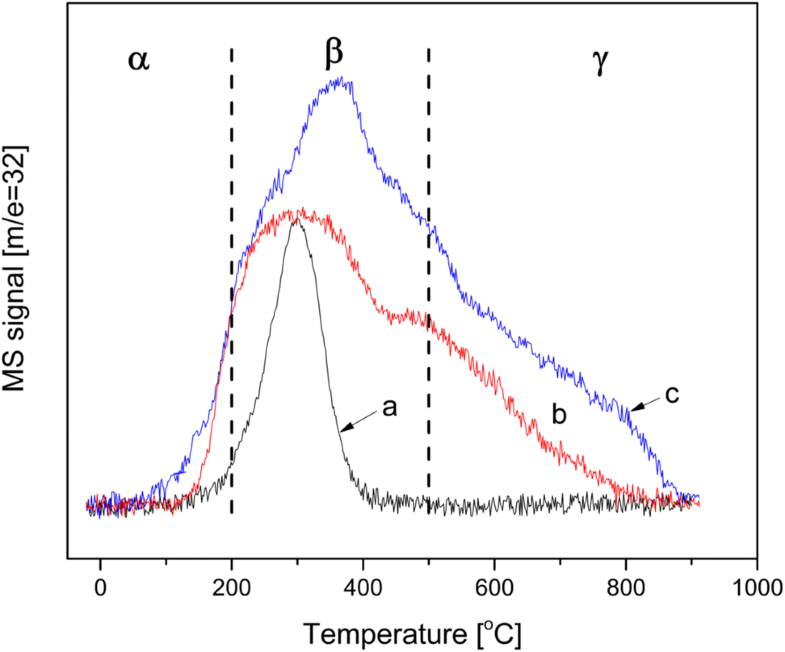 The diffractogram recorded for the La0.75Ag0.25FeO3 sample after heat-treatment for 50 h at 700 °C is also presented (Fig. 1g). The long-term heating can be considered a simulation of the catalytic reaction conditions. The LaFeO3 material can be described with orthorhombic symmetry in the Pbnm space group. After incorporation of silver ions into the LaFeO3 perovskite, its crystal structure did not change. However, the prepared catalytic materials are not a single phase because the XRD patterns of all samples, aside from reflections coming from the LaFeO3 perovskite structure, exhibit lines which are characteristic for La(OH)3 (2θ at 15.7°, 27.3°, 28.0°, 39.5° and 48.6°) (PDF Card No. 83-2034) with a hexagonal system and P63/m space group (Fig. 1a–f). The intensity of these reflections is similar for the La1−xAgxFeO3 perovskites with 0.05 ≤ x ≤ 0.2 (Fig. 1). Additionally, the XRD patterns of the La1−xAgxFeO3 perovskites with x = 0.1–0.25 also exhibit peaks ascribed to metallic silver (2θ at 38.1°, 44.6° and 64.6°) (PDF Card No. 06-4997) and the intensity of these peaks increases with the rise of Ag in the perovskite. This proves the incomplete incorporation of the silver into the LaFeO3 perovskite crystal structure and the high silver segregation upon increasing the amount of Ag in the perovskite. However, according to Pecchi et al. , due to the close proximity of the strongest diffraction lines of Ag0 and Ag2O (PDF card No. 12-793), it has been impossible to ascertain whether or not Ag2O is present in the perovskite samples studied. Metallic Ag is not visible only in the XRD pattern of the La0.95Ag0.05FeO3 perovskite i.e. for the sample with the lowest Ag content. Therefore, due to the limited solubility of Ag in LaFeO3, diffraction peaks of La1−xAgxFeO3 are not shifted towards the lower 2θ angles in comparison to corresponding peaks of the LaFeO3 sample. Bellakki et al. 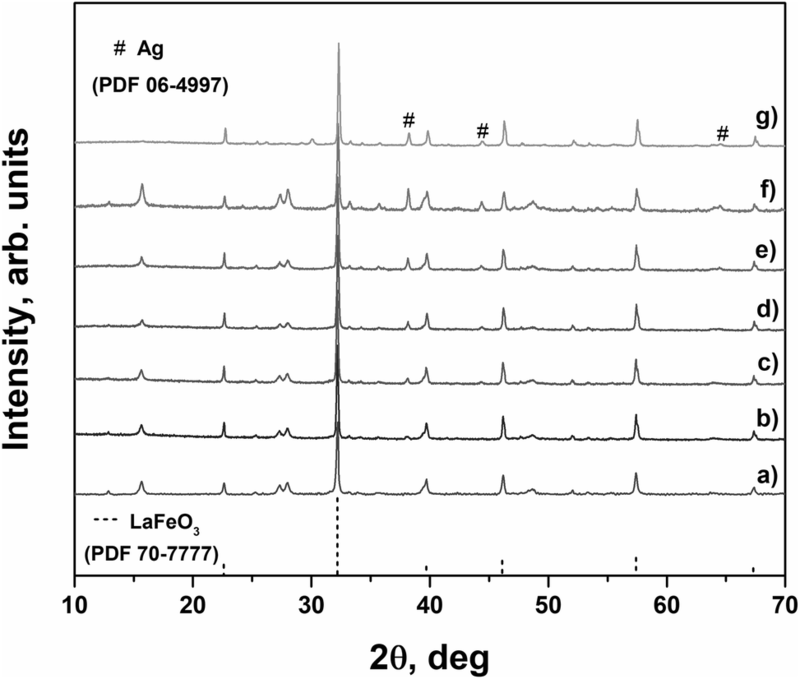 observed peak associated with AgO, which was not visible at lower Ag content, in the XRD pattern of La1−xAgxFeO3 perovskites for x > 0.3 (synthesized by the combustion process using glycine as a fuel). This demonstrates better incorporation of Ag into the perovskite structure than in our perovskites, in which the Ag peak is already visible at x = 0.1. Heating La0.75Ag0.25FeO3 perovskite for 50 h in air at 700 °C does not substantially alter the perovskite structure, as can be seen in Fig. 1g. However, the reflections from the Ag phase are characterized by a weaker intensity in comparison to that from a fresh sample (Fig. 1f). The reason may be better silver incorporation into the LaFeO3 perovskite crystal structure in the catalysts during the long-term heating. The disappearance of the reflections from the La(OH)3 structure can be also seen, which was expected. After such a long time of heating, the complete conversion of the lanthanum and iron compounds to LaFeO3 perovskite occurs. The average crystallite size of LaFeO3, La1−xAgxFeO3 and metallic Ag was calculated using the Scherrer formula and the results are shown in Table 1. For LaFeO3, the average crystallite size was 48 nm and for the Ag-substituted perovskites, it was 45–47 nm. The average crystallite size of metallic Ag, calculated from the line broadening of the Ag peak at 2θ = 38.1° (the most intensive Ag peak partly overlapped with a weak perovskite peak) amounted to 31, 36, 40 and 41 nm for the La1−xAgxFeO3 perovskite with x = 0.1, 0.15, 0.20 and 0.25, respectively. However, the Ag crystallite size calculated from the peak at 2θ = 44.6° (not overlapped, but low peak intensity) was much lower, 30 nm, for the perovskite with x = 0.20 and 0.25. HRTEM studies of the catalysts not doped with silver and calcined in air at 750 °C for 6.5 h, confirmed the presence of the LaFeO3 and La(OH)3 phases in the sample, as was visible on the XRD diffractograms. Example pictures in Fig. S1 (Supplementary material) show crystallites with lattice fringes of about 0.32 nm and 0.28 nm distance, which fit those of the (120) and (200) LaFeO3 crystal planes, respectively. The fast Fourier transform (FFT) from this phase contains spots with a 55° angle between them, which corresponds to the values from the database for an orthorhombic perovskite structure. Analogical analysis revealed spots in the FFT at 0.33 nm and 0.39 nm with a 90° angle between them, which characterized the (110) and (001) La(OH)3 crystal planes, respectively. Additionally, very small particles of Fe2O3 with lattice fringes of 0.37 nm and 0.27 nm distance (47° angle between spots in the FFT), which fit the (012) and (104) crystallographic planes, were also visible. In some pictures, La2O3 crystallites exhibited as a 0.30 nm spot from (101) crystal plane were present in FFT (Fig. S1). These small particles (less than 5 nm) could not be detected by XRD. These results clearly indicate that Fe2O3 and La2O3 did not completely react under the synthesis conditions used. The unreacted iron oxide is present in the sample in the form of very small particles dispersed on the perovskite crystallites. By contrast, most of the unreacted lanthanum oxide is transformed into La(OH)3 after exposure to the wet air at room temperature. Generally, lanthanum oxide is known to be highly hygroscopic and powder samples of La2O3 rapidly convert to lanthanum hydroxide in wet air . For this reason, we additionally prepared the fresh LaFeO3 and La0.75Ag0.25FeO3 samples by storing them in an He atmosphere before the XRD measurements. Next, the catalysts were exposed to air overnight at room temperature and the second XRD experiments were carried out. The XRD diffractograms obtained are presented in Fig. S2 (Supplementary material). Thus, it is clearly visible that the XRD profiles from fresh catalysts contain the reflections from La2O3 structure (PDF card No. 05-0602), while those from the samples after the exposure to wet air are characterized by reflections from the La(OH)3 phase. Texture characteristics of the calcined perovskites were determined based on the nitrogen adsorption–desorption isotherms and the results are listed in Table 1. Regardless of the amount of silver in the La1−xAgxFeO3 perovskite, their specific surface area is nearly the same, 5.2–5.6 m2/g. They are slightly lower than the specific surface area of the unsubstituted LaFeO3 perovskite (7.6 m2/g). However, the total pore volume significantly drops from 0.04 cm3/g to 0.012–0.015 cm3/g for the LaFeO3 and La1−xAgxFeO3 perovskites, respectively. This may suggest incorporation of the silver into the pores of the LaFeO3 perovskite. 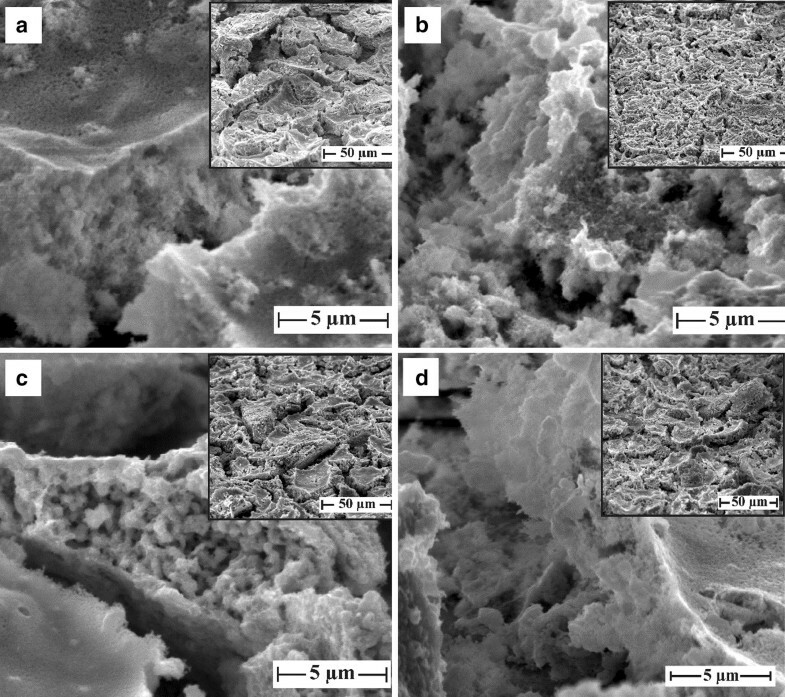 An SEM analysis revealed that, irrespective of the Ag content, the active layers of La1−xAgxFeO3/FeCr20Al5 catalysts were cracked and porous (Fig. 2). Increasing the silver content (x) in the La1−xAgxFeO3 perovskite from 0.10 to 0.25 did not result in any significant changes in the morphology of the catalysts (Figs. 2a–c), whereas a distinct difference is observed on the fracture surfaces of the layers. The catalysts’ active layers containing 0.10 and 0.15 mol of Ag (Figs. 2a and 2b) have a fine-grained structure, as opposed to the layer containing 0.25 mol of Ag, which is less compact and composed of agglomerates a few hundred nm in size (Fig. 2c). The surfaces of all the active layers are heterogeneous with randomly distributed light precipitations about 1 µm in size. These precipitations are particularly visible in the BSE mode (Figs. 2a–c), which indicates that their chemical composition differs from the bulk catalyst composition. This is confirmed by the layer surface mapping results from the La0.75Ag0.25FeO3 perovskite with the highest Ag content (Fig. 3). Although no quantitative differences in the catalyst’s chemical composition within the analysed area can be seen in the recorded elemental maps, the latter clearly show that the small precipitations visible in Fig. 2 are enriched with Ag. This hypothesis is supported by the distribution of Ag shown in Fig. 3 and by the spectra for the whole surface of the sample and for those light precipitations included in this figure. One can clearly see that only silver is distributed nonuniformly. The other elements (oxygen, lanthanum and iron) are homogeneously distributed on the surface. Figure 2d shows the surface of the La0.75Ag0.25FeO3 catalyst after 50 h of operation at 690–700 °C. As a result of catalyst heat-treatment for 50 h, the layer’s surface becomes more porous and the previously visible silver-enriched precipitations disappear. Therefore, one can suppose that the silver was redistributed during the 50 h of catalyst operation, and the microscale chemical composition became homogenous. The reduction process of the La1−xAgxFeO3 catalysts with different silver loadings was investigated using a TPR technique. Figure 4 presents the TPR profiles of a standard LaFeO3 sample and of La1−xAgxFeO3 for x = 0.15, 0.25 catalysts calcined at 750 °C. XRD and HRTEM data showed that after heat treatment at 750 °C, the samples showed a partially ordered orthorhombic LaFeO3 phase that was contaminated mainly by La2O3/La(OH)3 and amorphous Fe2O3 phases. Table 2 shows the average Fe2O3 content calculated from TPR results of perovskite samples. Nevertheless, the presence of an amorphous Fe2O3 phase cannot be easily recognized due to the limitations of the XRD technique. It has been reported that the very weak TPR profiles of pure LaFeO3 were affected by preparation method, and especially by the temperature of calcination, mainly due to phase impurities (Fe2O3) . As shown in Fig. 4a, the reduction of LaFeO3 was a stepwise process in the 150–350 °C region. The first reduction peak of the perovskite sample (about 200 °C) was assigned to the removal of adsorbed oxygen species, and the peak at 320 °C was due to the reduction of Fe+4 to Fe+3. The TPR signal at high temperatures, > 750 °C, (not completely detected, even up to 1000 °C), can be attributed to the reduction of perovskite lattice oxygen and/or part of the Fe+3/Fe+2 to Fe0. These signals are equal for all samples. The quantitative hydrogen consumption is shown in Table 2. In Fig. 4a, the main H2 consumption is in the 350–750 °C range and is related mainly to the reduction of the Fe2O3 phase (see HRTEM Fig. S1 Supplementary material). The reason for the formation of nanocrystalline Fe2O3 could be the short time of calcination (6.5 h) or insufficient temperature (750 °C) during the calcination process. It’s well known, that the TPR profile of Fe2O3 contains two composite peaks. According to the calculated area ratios of individual peaks at about 420 °C and the broad peak at 590 °C, which was about 1:8 for pristine Fe2O3 (see Table 2), we assume the following three-step Fe2O3 reduction process: Fe2O3 → Fe3O4 → FeO → Fe. The XRD spectra collected after TPR experiments (Fig. S3 Supplementary material) up to 1000 °C revealed the presence of metallic iron (α-Fe). Perovskite was always present as the most abundant phase and this should testify to the reduction only of a fraction of Fe+3/Fe+2 ions in the B-sites of the perovskite. Moreover, in order to preserve the perovskite structure, a fraction of La (Ag) ions should also be expelled from the A-sites and, in fact, extra very active dispersed metallic silver nanoclusters are present out of the perovskite lattice. Additionally, Ag-Fe nano-alloys were found after the TPR run in perovskite samples containing Ag. In the low-temperature region (10–150 °C) for La1−xAgxFeO3 samples, two very low peaks (insets in Fig. 4b, c) of H2 consumption with a maximum at 40 and 80 °C are observed. Both peaks may be attributed to the reduction of dispersed silver oxide-like species and small oxidized silver clusters Ag n +δ . The peak shoulders at 130 °C may be associated with the reduction of Ag2O on the surface of the catalyst . The area of peaks in the range of 10–150 °C corresponds to an H2 consumption of ~ 11 µmol/g (Table 2), which corresponds to 1.0–1.2% of Ag+ from the total amount of silver in the catalysts. Therefore, most of the silver is stabilized in a metallic state after oxidative pre-treatment at 750 °C for La1−xAgxFeO3 samples. However, part of the silver could be in ionic (perhaps, clustered) forms strongly interacting with the perovskite support (peaks at above 300 °C) in regions where reduction of the perovskite and Fe2O3 overlapped, making analysis impossible. Ag addition to LaFeO3 led to a 60 °C shift towards lower temperature for the first reduction peak without affecting the second one. Though TPD-MS analysis is hard to interpret quantitatively, it seems unlikely that such an intense reduction feature can be ascribed to AgOx reduction, due to its very low amount. In general, the catalytic performance of materials for oxidation reactions is correlated with the capability to activate oxygen. Figure 5 presents the oxygen desorption behaviour (O2-TPD profiles) of the samples. However, from the TPD profiles, it is hard to differentiate the oxygen species desorbed from the samples based on the desorption temperature due to the very weak and broad peaks observed in the profiles. In general, three major oxygen desorption regions were observed for perovskite samples. The first desorption peaks belong to the α-oxygen region (< 200 °C), which was mainly the physical adsorbed oxygen species (O2) (< 100 °C) and part of the active chemically adsorbed surface oxygen (O2− or O 2 −2 ) with weak interaction with surface vacancies (60–300 °C). The oxygen species desorbed in the 200–500 °C range of were assigned to chemisorbed surface (O2− or O 2 −2 ) and sub-surface-active oxygen (O−), which was denoted as β-oxygen. The sub-surface oxygen (O−) was chemically adsorbed on oxygen vacancies with strong interaction with defects (dislocation and grain frontiers) (300–600 °C). The high-temperature desorption peaks appearing above 500 °C were attributed to perovskite bulk lattice oxygen (O−2), so-called γ-oxygen. As shown in Fig. 5a, O2-TPD results indicated that the O2 desorption peak of pure LaFeO3 carrier is very weak (~ 3.1 µmol/g) with one desorption peak at 300 °C and very small shoulders at 201 °C. 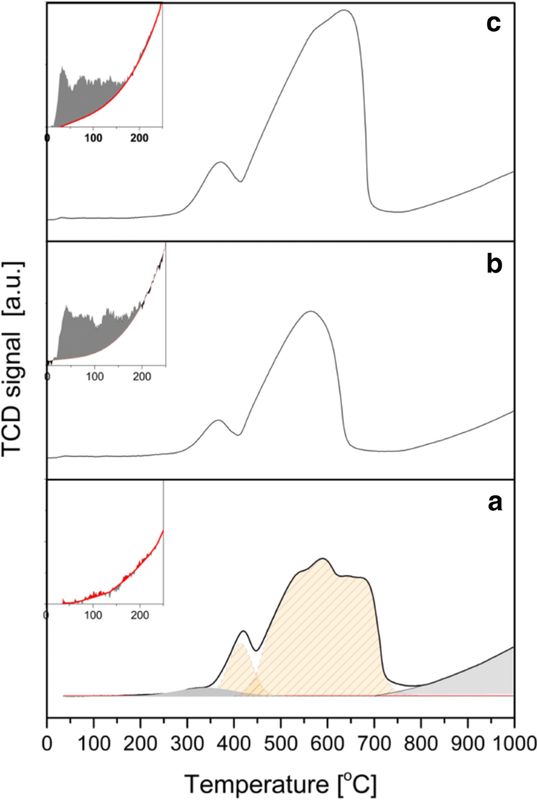 However, the O2-TPD profile of La1−xAgxFeO3 catalyst shows that there are six oxygen desorption peaks at 140, 220, 300, 370, 454 and 650 °C obtained after deconvolution of broad TPD-O2 profiles, which are associated with presence of dispersed Ag° as well as Ag+ incorporated in the bulk perovskite lattice in A-sites. Additional oxygen desorption is associated with dispersed Ag0 as well as Ag+ incorporated in the bulk perovskite lattice in A-sites. Total oxygen desorption is increased to 10.3 and 14.6 µmol/g for La0.85Ag0.15FeO3 and La0.75Ag0.25FeO3 samples, respectively. The amount of active surface oxygen species of the catalyst increases with increasing silver content and the size of Ag particles (Table 3). An analysis of the calculated La/Fe atomic ratios (Table 4) for the powders of the La0.9Ag0.1FeO3 (La/Fe = 2.4) and the La0.75Ag0.25FeO3 (La/Fe = 2.87) perovskites showed that their surfaces were enriched in La relative to the nominal bulk concentration, 0.9 and 0.75, respectively. A comparison of the atomic ratios Ag/Fe and Ag/La and the absolute Ag contents in the samples analysed as-received and after Ar+ sputtering, shows the Ag content to be higher on the surface than inside the grains of perovskites La1−xAgxFeO3, x = 0.1 and 0.25 (Table 4). Moderate Ar+ sputtering (2 keV, 4 μA/cm2, 60 s) resulted in a three-fold reduction (as measured by the ratios Ag/Fe and Ag/La) in Ag content on the surface of the La0.75Ag0.25FeO3 sample and in a 2.5-fold reduction in Ag content on the surface of the La0.9Ag0.1FeO3 sample. This applies to both the fresh perovskite powders and after heat-treatment in air at 700 °C for 50 h. However, after 50 h of heating, the La0.75Ag0.25FeO3 perovskite showed a further four-fold reduction in Ag content (as measured by the ratios Ag/Fe and Ag/La) on the analysed as-received surface, from 0.68 and 0.24 to 0.15 and 0.06, respectively (Table 4). This may be indicative of silver incorporation into the structure of the perovskite after long heating at a temperature of 700 °C or silver agglomeration. Additionally, for the monolithic catalyst obtained by depositing La0.75Ag0.25FeO3 perovskite on the support made of FeCr20Al5 foil, the La/Fe ratio of 4.86 is considerably higher than the stoichiometric ratio and higher than the ratio obtained for the perovskite powder (Table 4), which indicates an La concentration gradient in the catalyst’s depth profile. As a result of the selective segregation of La towards the surface, the surface silver fraction relative to the lanthanum fraction (calculated as Ag/La) decreased from 0.24 (the perovskite powder) to 0.13 (the catalyst), and after 20 h of heating the catalyst at 700 °C it remained essentially unchanged. At the same conditions, the Ag/Fe ratio remained at 0.68 (the perovskite powder) and 0.63 (the catalyst). After 20 h of heating, the Ag/Fe ratio decreased to 0.53. After heat-treatment the catalyst containing La0.75Ag0.25FeO3 perovskite deposited on a support made of FeCr20Al5 foil at 700 °C for 1 h, the XPS spectrum showed the presence 12.0 wt% aluminium (Table 4). The presence of Al was the result of the segregation of Al3+ ions from the bulk of the FeCr20Al5 alloy towards the surface and then out of the surface of the La1−xAgxFeO3/FeCrAl catalyst at high temperatures. Initially, no Al was observed in the fresh catalyst calcined at a temperature of 500 °C. The surfaces of all the analysed samples contained considerable amounts of adventitious carbon and its compounds (Table 4). Ar+ sputtering revealed that the carbon content had a mostly superficial character. 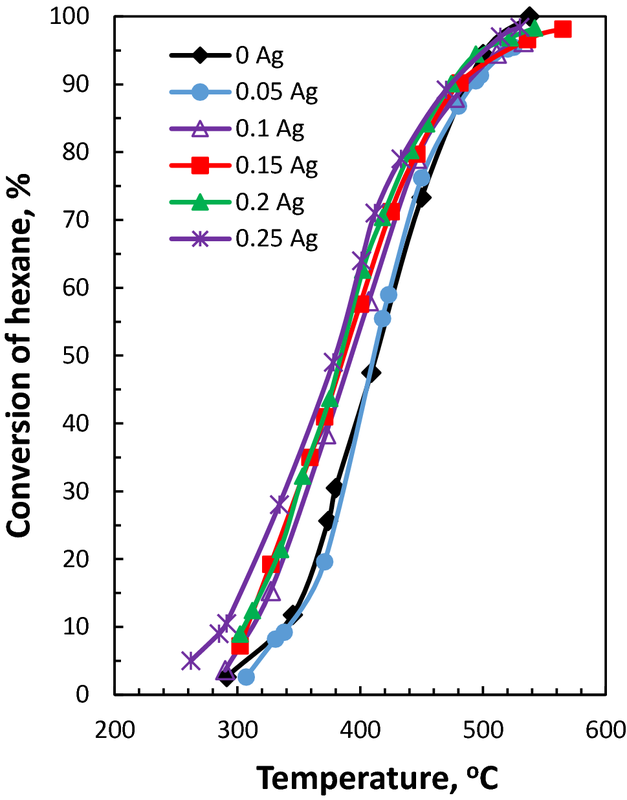 A close look at the Ag 3d5/2 binding energies of metallic silver and its oxides, compiled in the NIST XPS database  and reported in other works [42, 43] shows some dispersion of the values and their superpositions (three different silver chemical states fall within the 1.2 eV interval), which makes the assignment of spectral features a difficult task. Ag 3d5/2 is reported to range from 367.9 to 368.4 eV for Ag0, from 367.6 to 368.5 eV for Ag2O and from 367.3 to 368.1 eV for AgO. For these reasons, the use of the Modified Auger Parameter (MAP) to distinguish silver oxidation states is usually considered to be more reliable than finding the absolute (corrected) binding energy of Ag 3d5/2. Another advantage of the MAP is that it does not depend on the sample charge shift and so one avoids a charge correction of the spectrum, which can be misleading due to the existence of substrate/overlayer contact potentials or differential charges. However, it is still practically impossible to distinguish Ag2O from AgO, especially when the oxides occur simultaneously . Figures 6 and 7 show high-resolution XPS spectra of Ag 3d and Ag MNN envelopes in the analysed samples. In the simplified deconvolution procedure, only two species of silver were hypothetically assumed, i.e. Ag oxides (AgO and Ag2O) and metallic Ag, shifted relative to each other by 0.8 ± 0.05 eV . In the case of La0.75Ag0.25FeO3 powders heat-treatment at 700 °C for 50 h, the calculated values of MAP, i.e. MAP1 (3d5/2—M4N45N45) and MAP2 (3d5/2—M5N45N45), amounted to 724.2 and 718.7 eV, respectively (Fig. 6) as well as narrow Ag 3d5/2 (FWHM 1.7 eV) peak clearly indicated the silver to be in the oxidized homogenous form . Its binding energy amounted to 367.9 eV and was assigned to AgO. However, the best fit was achieved by assuming the presence of small amounts of metallic Ag that can occur under the silver oxide layer. In fact, moderate Ar+ sputtering revealed that the thin AgxO film covered Ag0 crystallites since, after the sputtering, the fraction of metallic silver in the Ag 3d spectrum increased from about 6 to 23%. The above procedure for interpreting Ag 3d spectra was also applied to the surface of the fresh La0.75Ag0.25FeO3/FeCrAl catalyst heated at 700 °C for 1 h just before the sample was put into the UHV chamber. Additionally, in this case, the values of MAP1 and MAP2, amounting to 718 and 724 eV, respectively, unequivocally indicated the dominant presence of AgxO on the catalyst’s surface (Fig. 7). But the Ag M4N45N45 and Ag M5N45N45 peaks were not as well separated from each other as in Fig. 6, which indicated greater heterogeneity of the Ag forms, including a larger fraction of Ag0. The percentage of Ag0/Agtotal on the as-received surface (evaluated based on the deconvolution of the Ag 3d spectra), amounted to about 34%, after sputtering this percentage increased to 43%. Based on the Ag 3d and Ag MNN spectra and the elemental analyses (Table 4), one can conclude that the heat-treatment of La0.75Ag0.25FeO3 powder for 50 h and the catalyst made of this powder for 20 h at 700 °C resulted in an increase in the amount of Ag incorporated into the structure of the perovskite. Some of the silver probably underwent sintering/agglomeration. This is confirmed by XRD analyses, showing that the amount of Ag0 decreased after heat-treatment of the La0.75Ag0.25FeO3 perovskite for 50 h (Fig. 1). The shapes of the Fe spectra of all the analysed samples were very similar to each other. In the Fe 2p spectra (Fig. 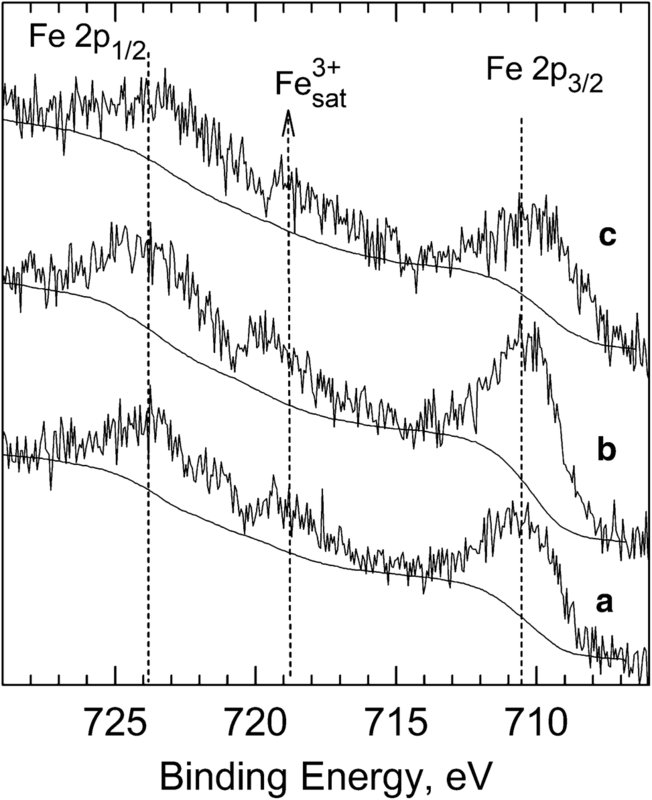 8) two distinct peaks at binding energies of ∼ 710.4 eV for Fe 2p3/2 and ∼ 723.9 eV for Fe 2p1/2 with a shakeup satellite at ~ 718.9 eV are observed. That latter peak corresponds to the characteristic of Fe3+ ions in their oxide form. The La 3d doublets located at 834.0 and 850.8 eV (the spectra are not included) were ascribed to the La–O bonds of 3d5/2 and 3d3/2. Each of the doublets was further split into two components, due to the charge transfer from the ligand 2p level to the La 4f level. The spin–orbit splitting gap of ∼ 16.8 eV between 3d3/2 and 3d5/2 peaks is also indicative of the La3+ state . The investigations have shown that the substitution of some of the La3+ in LaFeO3 with Ag+ results in an increase in the perovskite’s activity in methane oxidation. The test results presented in Fig. 9a and in Table 5 show that when the silver content in the La1−xAgxFeO3 perovskite is increased from 0.05 mol to 0.25 mol, the catalyst’s activity increases and the temperature of methane conversion over the catalyst goes down. Even when as little as 0.05 mol of the lanthanum is substituted with silver, T10 and T50 are lower by 18 and 8 °C, respectively, in comparison to the catalyst without silver, containing 15.9 wt% LaFeO3. A marked increase in methane oxidation activity, in comparison with the LaFeO3 catalyst, is observed for the catalysts with La0.8Ag0.2FeO3 and La0.75Ag0.25FeO3 perovskites. The activity of the catalysts with perovskites containing silver is higher even though the La1−xAgxFeO3 perovskite content in the catalyst is over 3 wt% lower (12.2–12.9 wt%) than the LaFeO3 content (15.9 wt%). Additionally, the activity of all the catalysts with perovskites La1−xAgxFeO3x = 0.05–0.25 is distinctly higher than that of the catalyst containing 10.7 wt% LaFeO3. The catalysts with the La0.75Ag0.25FeO3 perovskite, containing the largest amount of silver, show the highest activity in methane oxidation (Fig. 9a). In order to determine the apparent activation energy of the methane oxidation reaction over the particular perovskites, the ln[−ln(1 − α)] = (1000/T) dependence, where α is the conversion of methane and T is the catalyst temperature, was plotted (Fig. 9b) [7, 14]. The values of apparent activation energy (Ea) were calculated from the Arrhenius equation based on the slope of the plotted straight line. Ea for methane oxidation over the LaFeO3 catalyst is 106.6 kJ/mol. Silver addition to LaFeO3 perovskite lowers the Ea to about 91.5–91.2 kJ/mol for x = 0.2 and 0.25 (Table 5). This indicates that the introduced silver has a considerable influence on methane oxidation over the catalysts tested. The specific surface of the perovskites does not contribute to the increase in the activity of the La1−xAgxFeO3 perovskites as the Ag content is increased since for the perovskites containing 0.05–0.25 mol of Ag this surface is similar, amounting to 5.2–5.6 m2/g (Table 1). The specific surface of the perovskites which contain Ag is smaller than that of the LaFeO3 perovskite (7.6 m2/g). Thus, it can be concluded that the silver introduced into the perovskite enhances its methane oxidation activity. The obtained results show that, for the preparation method used, the solubility of silver in the LaFeO3 perovskite is low. XRD tests showed that a small amount of Ag0 (with crystallites 31–41 nm in size) is already present apart from the perovskite phase in La1−xAgxFeO3 at x ≥ 0.1. Additionally, the mapping of the surface of the catalyst containing La0.75Ag0.25FeO3 shows that silver precipitations are present on the surface of the perovskite layer. Other researchers point to the low solubility of silver in LaMO3 perovskites, where M = Mn, Co, Fe [4, 15, 22, 23, 24, 25]. 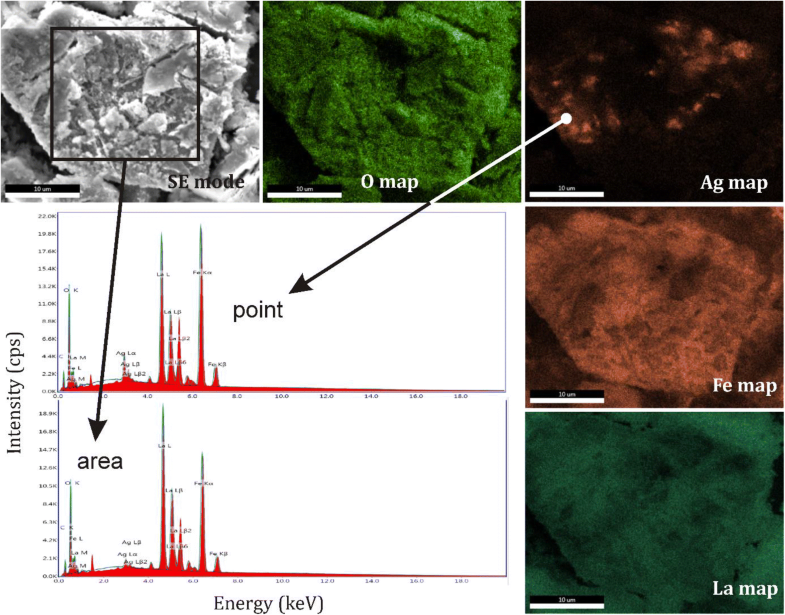 XPS tests show that the metallic silver present on the surface of La1−xAgxFeO3 perovskites, x = 0.1, 0.15, 0.25, is coated with a thin film of AgxO, which suggests that Ag0 undergoes superficial oxidation during perovskite preparation. This is confirmed by TPR tests which showed that in La1−xAgxFeO3 perovskites, x = 0.15, 0.25, only 1.0–1.2% of the total silver is in the form of Ag2O. More than 98.8% of the total silver is stabilized in a metallic state or incorporated into the perovskite lattice. Ag2O decomposes to Ag0 at the temperature of 230–330 °C , i.e. at a temperature lower than that at which the oxidation of methane and hexane was conducted. At the above temperatures, the Ag2O coating the surface of Ag0 decomposes and metallic silver is present in the catalysts, favourably affecting their activity. The Ag0 covered by a stable surface oxygen species appears to be the active phase at methane oxidation. Large Ag0 crystallites 31–41 nm in size were found (XRD) to be present in the La1−xAgxFeO3 perovskites. The size of the Ag crystallites increases from 31 nm (x = 0.05) to 41 nm (x = 0.25) (Table 1) with the silver content in the perovskite. The simultaneous increase in the activity of the catalysts is evidence of the high activity of the large crystallites of Ag0. Similar results were obtained by Buchneva et al. for LaCoO3 perovskite with an Ag addition. They found that large silver crystallites led to weak Ag–O bond and increase oxygen mobility out of the crystal lattice, causing catalyst activity increases. Small silver crystallites strongly bind oxygen, which makes its participation in the oxidation reaction difficult and lowers the activity of the perovskite . The introduction silver to the LaFeO3 perovskite increases the amount of oxygen desorbed from the perovskite’s surface. The O2-TPD profiles of La1−xAgxFeO3x = 0–0.25 show that the amount of oxygen desorbed from the LaFeO3 perovskite after silver is introduced into it increases from 3.1 µmol/g for LaFeO3 to 10.3 and 14.6 µmol/g for La0.85Ag0.15FeO3 and La0.75Ag0.25FeO3 (Table 3). This indicates an increase in active surface oxygen species that can take part in the oxidation of hydrocarbons, and an increase in oxygen mobility out of the perovskite, significantly enhancing the effectiveness of hydrocarbon oxidation. Additionally, Choudhary et al. [1, 2] found that the substitution of La with Ag in LaMO3, where M = Co, Mn, Ni, Fe, and LaFe0.5Co0.5O3 perovskites increases the reactivity of the perovskite’s lattice oxygen at a low temperature. As a result, pure methane oxidation takes place over 30 pulses of the pulse-reaction despite the absence of oxygen in the gaseous phase. The operating stability of the most active monolithic catalyst with the La0.75Ag0.25FeO3 perovskite was tested in methane oxidation at a temperature of about 690–700 °C for 50 h. During the first 14 h of catalyst operation, the conversion of methane gradually decreased from 100% at 670 °C to 97–99% at 690 °C and remained at this level to the end of the test (Supplementary material Fig. S4). After the 50 h long operation of the La0.75Ag0.25FeO3 catalyst at 690 °C, T50 and T90 increased by 18 and 19 °C, respectively, in relation to the fresh catalyst (Table 5). But the activity of this catalyst was still higher than the initial activity of the LaFeO3 perovskite catalysts without any silver addition and the activity of fresh catalysts with La1−xAgxFeO3 perovskites, x = 0.05, 0.1 and 0.15 (Table 5). The XRD, XPS and TPR tests show a reduction in the amount of metallic silver after the heat-treatment of the La0.75Ag0.25FeO3 perovskite at 700 °C for 50 h. This may indicate an increase in the amount of silver incorporated into the perovskite’s structure. However, a reduction in the amount of Ag0 in the perovskite can be one of the causes of the decrease in the catalyst’s activity. As shown in Fig. 10, the activities of the catalysts with La0.95Ag0.05FeO3 and LaFeO3 perovskites for n-hexane oxidation are very similar, which means that the substitution of 0.05 mol of La with Ag in the LaFeO3 perovskite does not increase its activity. The catalysts with the La1−xAgxFeO3 perovskites at x ≥ 0.1 show distinctly higher activity than the LaFeO3 catalyst. But in the investigated temperature range, only a slight increase in the catalyst activity is visible as the silver content in La1−xAgxFeO3 is further increased from 0.1 to 0.25 mol (Fig. 10). The T10 and T50 determined for hexane oxidation over the La0.8Ag0.2FeO3 catalyst are lower by only 8 °C for the La0.9Ag0.1FeO3 catalyst. T90, 475 °C and 490 °C, respectively, was more different for these catalysts (Table 5). 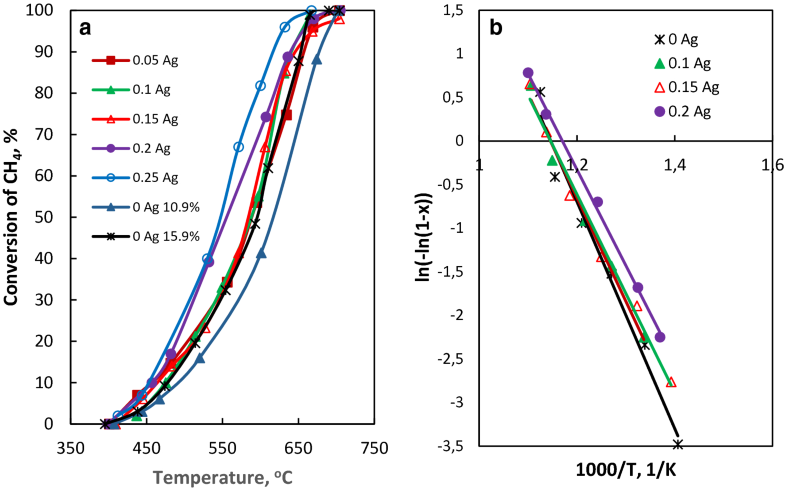 As a result of the increase in perovskite silver content from 0.2 to 0.25 mol, T10 and T50 decrease by 17 °C and 3 °C, respectively, while T90 does not change. The La0.75Ag0.25FeO3 catalyst that had oxidized methane at 690–700 °C for 50 h showed the same activity as fresh catalyst up to about 400 °C when tested for hexane oxidation. At higher temperatures, the catalyst’s activity is lower than that of fresh catalyst and after catalyst operation, T90 increases by 35 °C. The La1−xAgxFeO3x = 0.1–0.25 catalysts are distinctly more active in hexane activation than the LaFeO3 catalyst without Ag (Fig. 10). Similar to methane oxidation, in hexane oxidation the Ag0 present outside of the perovskite shows the ability to adsorb oxygen and to increase oxygen mobility out of the crystal lattice while the partial incorporation of the silver into the perovskite’s crystal lattice leads to the deformation of its structure, enhancing the perovskite’s activity in hexane oxidation. Pecchi et al. also found that despite the incomplete incorporation of Ag into the structure of La1−xAgxMn0.9Co0.1O3 perovskite the segregating metallic silver phase provides additional active centres in hexane activation, enhancing the catalyst’s activity. For the preparation method used, 0.05–0.1 mol of silver is incorporated into the structure of the LaFeO3 perovskite. At x ≥ 0.1 some of the silver in the La1−xAgxFeO3 perovskite remains in the form of large crystals of metallic silver (XRD) coated with a thin film of silver oxide AgxO (XPS, TPR). The introduction of silver into the LaFeO3 perovskite enhances its activity in oxidation methane and n-hexane. The catalysts with La1−xAgxFeO3 perovskites show higher activity in n-hexane oxidation at x ≥ 0.1 and higher activity in methane oxidation at x ≥ 0.05 than the LaFeO3 catalyst. The activity of the La1−xAgxFeO3 catalysts in the two processes increases as the Ag content increases from 0.05 to 0.25 mol. The increase in the catalysts’ activity after the introduction of Ag into the LaFeO3 perovskite is due to changes taking place in the perovskite after some of the Ag is incorporated in its structure. Metallic silver in the form of large crystals (31–41 nm in size) also plays a major role, increasing the mobility of oxygen from the crystal lattice and total amount of oxygen desorbed from the surface of the catalyst. Monolithic catalysts containing La1−xAgxFeO3 perovskites are potential materials to be used in industrial processes such as exhaust gas clean up and catalytic combustion at low temperature. This work was financed by statutory activity subsidy from the Polish Ministry of Science and Higher Education No 0401/0157/18 for the Faculty of Chemistry at Wroclaw University of Science and Technology.